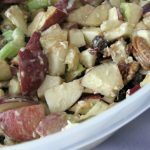 If you are doing some last minute entertaining or need to bring a dish to pass at a holiday party, this Apple Pecan Salad is easy to throw together and uses ingredients that are likely already in your pantry. Combine apples through coconut in a large bowl and set aside. Combine remaining ingredients and pour over salad. The verdict: This is called a salad but is definitely a dessert. So sweet, the raisins and peanut butter complement the apples beautifully. And the pecans add a nice crunch. A perfect dish to pass. Looking for more last minute holiday entertaining recipes? Check out the links below! « Need Help with Last Minute Holiday Recipes? Join us for a #SundaySupper Conversation! Do you make your own mayo? I have, but not on a regular basis. I haven’t quite mastered it. 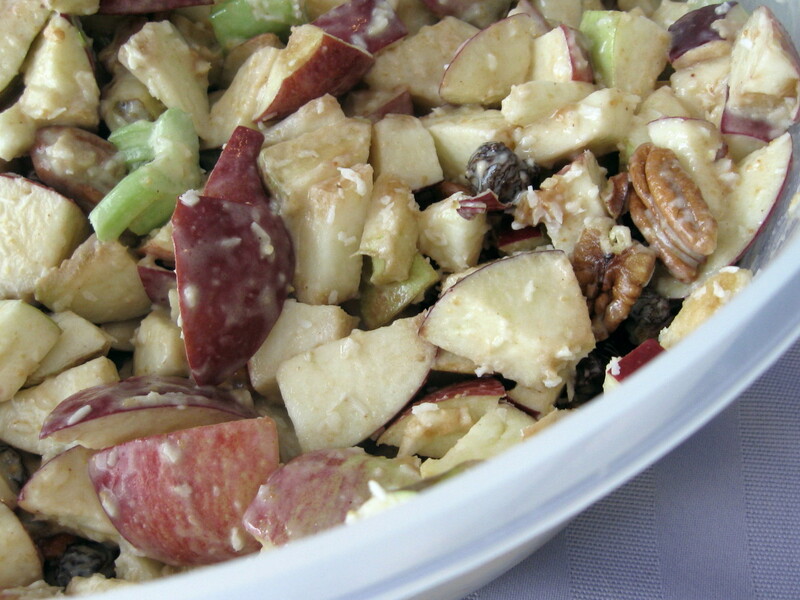 I love how you made the Waldorf salad even better—a little peanut butter and coconut push this over the top! Thanks so much for hosting us this week! You got me with peanut butter – I have to try this salad now. This is the perfect winter salad! This will be a hit with my family. Thanks so much for hosting this week & have a wonderful holiday.